Winter is still hanging on here in the Great Lakes Bay Region. As spring approaches, so does the threat of ice storms, so it’s a great time to make sure you’re prepared for power interruptions. Essexville Electric invites you to learn more about our Generac generator services at this weekend’s Midland Home & Garden Show. Essexville Electric will be at Booth Nos. 85-87 at the show Friday through Sunday (March 1-3) at Northwood University’s Hach Student Activity Center in Midland. You can learn more about the wide array of services offered by Essexville Electric, including our Generac generator services. Our E-Tec division also has a leading role in the home show. New to the show this year is the “Man Cave,” for which E-Tec provided sound services. 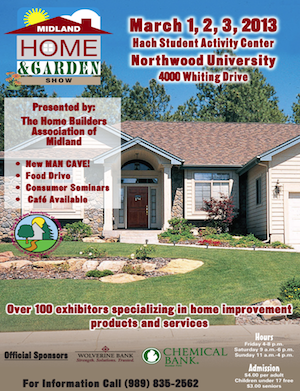 The Midland Home & Garden Show will feature more than 100 exhibitors specializing in home improvement products and services. Come visit Essexville Electric from 4-8 p.m. Friday, 9 a.m.-6 p.m. Saturday and 11 a.m.-4 p.m. Sunday. Admission is $4 for adults, $3 for seniors and free for those 17 and younger.